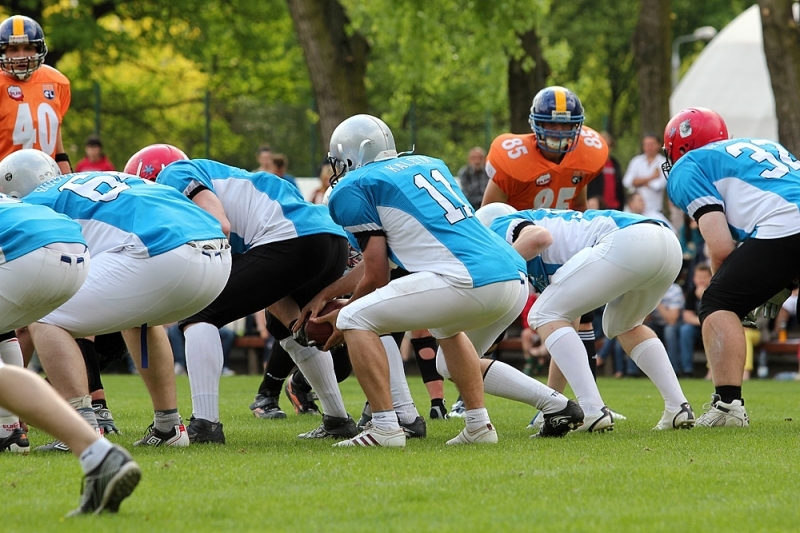 There were four games played in the opening weekend of the 2012 PLFA II season, and that quartet of matchups featured six teams making their debuts in that division. Half of the half-dozen, the Toruń Angels, Rybnik Thunders and Szczecin Cougars, came away victorious, while the Częstochowa Saints made a successful start to their second go-round in the league. The following is a game-by-game recap of the action. In the weekend's best game, the Rybnik Thunders opened the new PLFA II season with a 36-19 victory over their fellow debutantes, the Olkusz Silvers. The Thunders got off to a quick start with a fumble recovery in the Silvers end zone and an 80-yard touchdown run by Dawid Fojcik, building a 17-0 halftime lead. The beginning of the second half belonged to Olkusz, however, as the Silvers opened the third quarter with an 80-yard touchdown of their own. That came on a long pass from Michał Polak to Paweł Zieliński. Polak followed that up shortly afterwards with a 60-yarder to Piotr Banaś, cutting the lead to 17-13. Rybnik then bounced back to score the next two touchdowns and basically put the game out of reach, although Polak did manage to make it interesting late with another long touchdown pass to Zieliński. 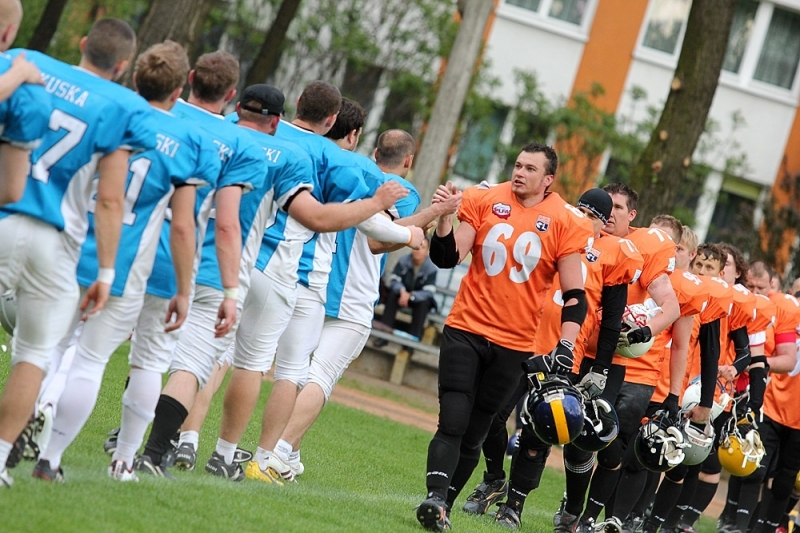 The Thunders joined the Częstochowa Saints as opening-weekend winners in the South Division. They will play their second game of the year in Rybnik on June 3, against the Rzeszów Ravens. The Silvers, meanwhile, will stay on the road for their second game, against the Tychy Falcons on May 19. 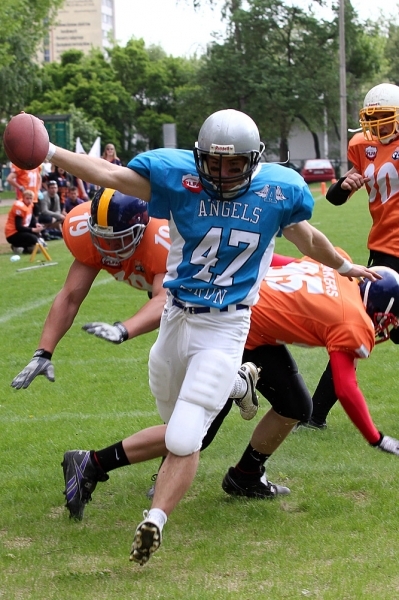 The Toruń Angels got the season's first win in the North Division, taking out the Olsztyn Lakers 28-6 at home on Saturday. The game started horribly for the Lakers, who gave up 20 points in a first quarter that also saw them lose their starting quarterback, Radosław Zajkowski, to a serious hand injury. Four different players scored in a balanced attack for Toruń. Olsztyn was able to steady the ship in the second quarter, scoring the only points of the frame early on to make the halftime deficit 20-6. Both teams bogged down in the wilting heat thereafter, and the Angels ended up with a comfortable victory. The Angels will look for their second win of the season in their first-ever road game, against the Warsaw Królewscy, on May 19. The Lakers will wait a bit longer before trying to even their record in their home opener, on June 3 against the Sopot Sabercats. 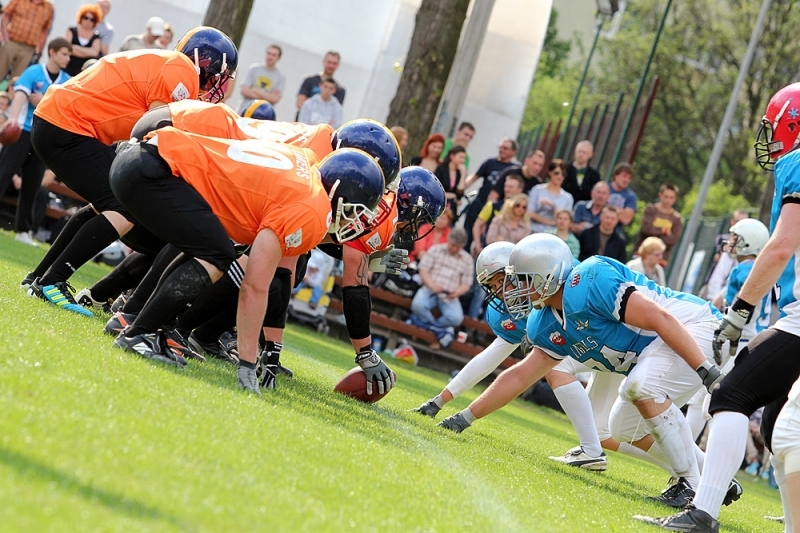 Football returned to its birthplace in Poland on Sunday afternoon, when the Warsaw Werewolves hosted the Szczecin Cougars at AWF in Warsaw, site of the first official game played in the country back in 2006. This game didn't go nearly as well for the home team as that one did, as the Werewolves were shut out by the visitors by a score of 45-0. The Cougars used a strong rushing attack to down the Werewolves, running the ball into the end zone five times. 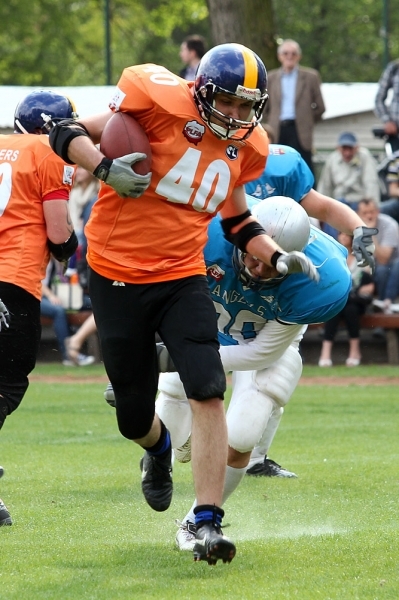 Tomasz Komosa had three touchdowns for the victors while quarterback Remigiusz Borejszo had a pair. Borejszo also threw a 20-yard touchdown pass to Jakub Piekarski. The Werewolves are still looking for their first victory in PLFA II after going 0-6 in the 2011 season. They will get their next chance at it on May 19, when the travel all the way up to Sopot to face the Sabercats. 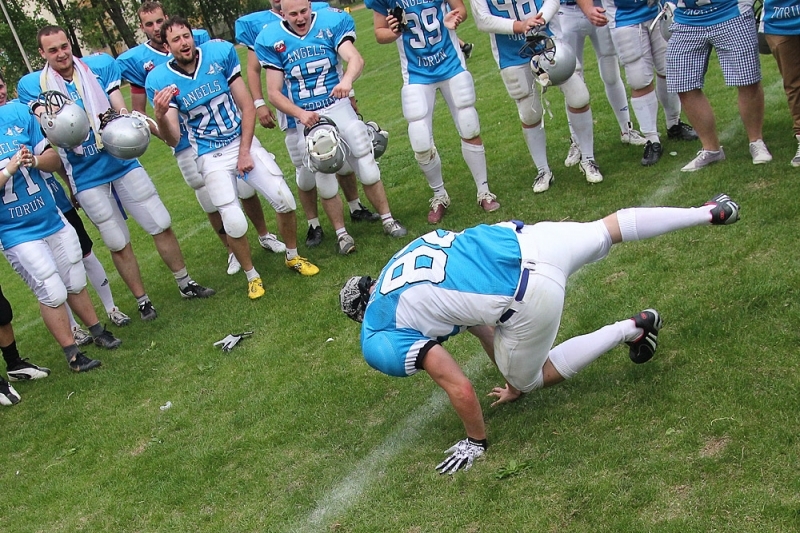 The Cougars will make their home debut on June 2, when they host Warsaw's other PLFA II squad, the Królewscy. 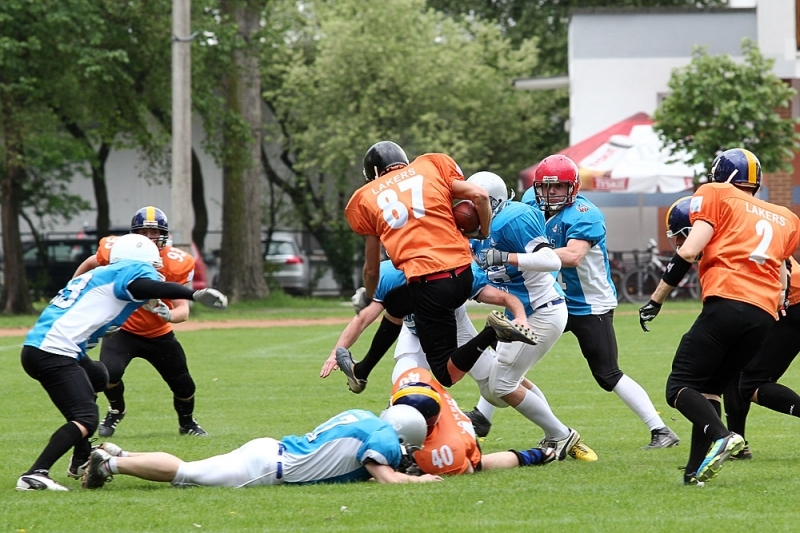 After going 0-for-6 in their 2011 PLFA II debut, the Częstochowa Saints came into their season opener hungry for a win. After going 0-4 in PLFA 8 last season, the Rzeszów Ravens felt the same way. 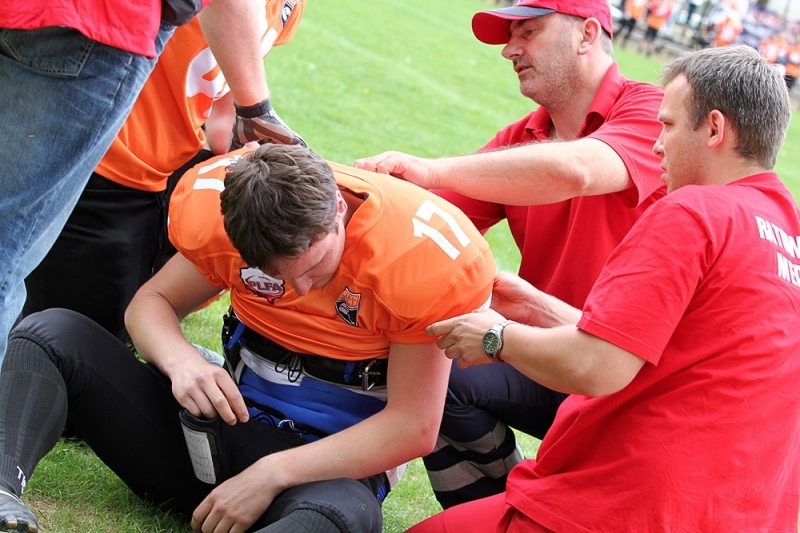 Something had to give on Sunday in Częstochowa, and in the end it was the home team that came away with a 34-12 victory. Long touchdowns by Jacek Wróblewski and Bartłomiej Marciniak gave the hosts an early 14-0 lead that the Ravens cut to 14-6 before halftime on a Damian Wróbel touchdown run. Marciniak then took the second-half kickoff back for a touchdown for the third quarter's only points, and the Saints had extended their lead to 34-6 before the Ravens would score again. Both teams have the rest of the month off before their next games. 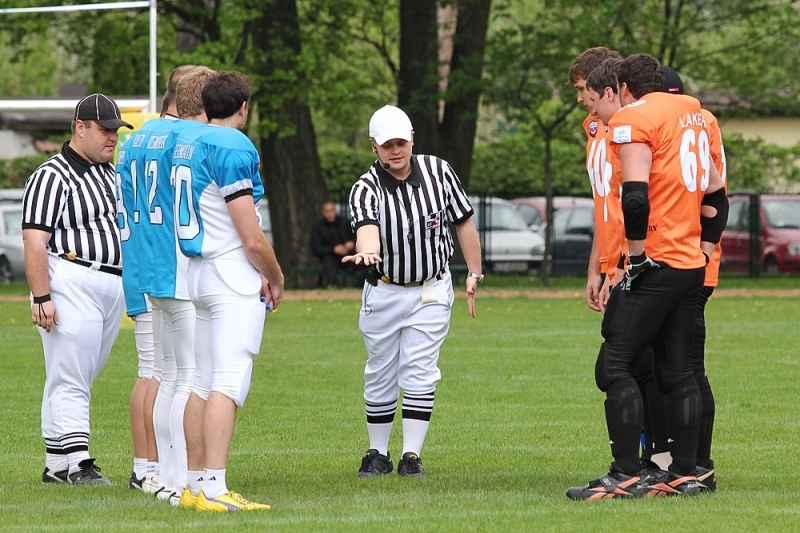 After a winless 2011, the Saints will look to stay unbeaten in 2012 on June 16 in Lublin, where they will face the Tytani. 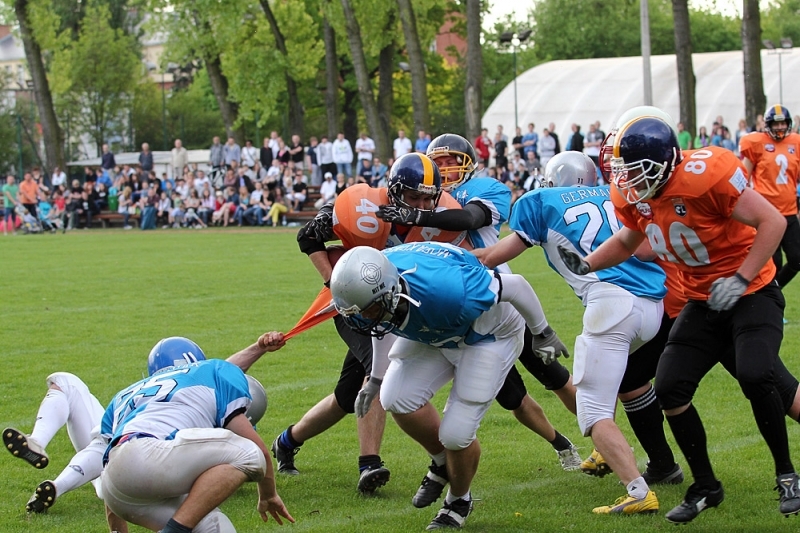 The Ravens, on the other hand, will next be in action June 3, hitting the road to face the Rybnik Thunders.